Rediff.com » Business » Dubai shock hits Indian workforce hard! Dubai shock hits Indian workforce hard! When Venkat came to Dubai in 2003 as a casual worker he brought with him a small suitcase and Rs 350,000 in family debt obligations, including the Rs 100,000 he owed the Indian firm that facilitated his recruitment. He was employed by a corporate office cleaning services company for 750 UAE dirhams per month, the equivalent of about Rs 8,000, which he says was more than five times the amount he could have earned in his village at that time. The company gave him dormitory accommodation in what Dubai calls a 'labour camp' and three pairs of uniforms that he himself washed once a week. After food and sundry expenses, Venkat sent back the equivalent of Rs 4,000 per month towards his family's upkeep in a village in Srikakulam district and the payments on the loan taken from a neighbouring village's moneylender. 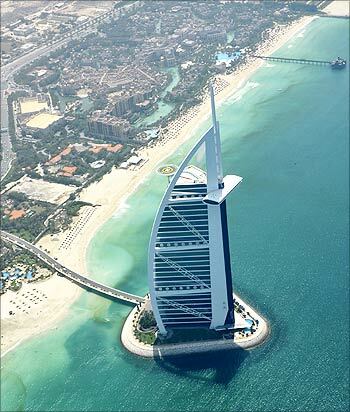 Image: An aerial image with the Burj Al Arab in the foreground. When the global economic meltdown started to be felt in Dubai in 2008 and large corporate entities began to actively cut costs, the cleaning company for which Venkat worked went bust and laid off all staff. Venkat was lucky. He was absorbed as full-time staff by one of his former company's clients and given a brand new set of uniforms. Other workers were not as lucky. As the crisis snowballed, hundreds of small and medium-sized enterprises caught the global bug and fell by the wayside. They either laid off thousands of migrant workers and office staff or sent them on indefinite unpaid leave. Large property and construction companies such as Nakheel and Arabtec implemented cost-cuts that included massive layoffs. By the middle of this year, job losses in Dubai had mounted into six figures, and the largest layoffs were among the property and construction sectors and the companies that serviced them. 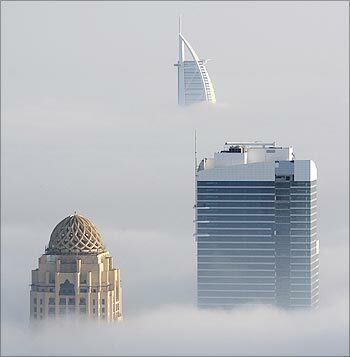 Image: The Burj Al Arab hotel (rear) towers above heavy fog in Dubai. The latest shock delivered by ports, property and hospitality conglomerate Dubai World asking lenders for a standstill agreement on servicing a debt that has ballooned to about $59 billion has the potential to send more jitters into an economy that was poised on the cusp of revival. In the absence of true data, perception has always played a major role in Dubai's and the United Arab Emirate's economic growth. While this worked well during boom times, it may have an unwarranted adverse effect today. "We are still expecting some job losses in the UAE economy but nowhere near the same rate as in the beginning of 2009 and in the first half of this year," said Shayne Nelson, Standard Chartered's chief executive for the Middle East and North Africa. The bank expects the UAE economy to be one of the handful in the world to record positive growth this year, however minuscule. Perception could prove to be another blow for Indian workers, for whom the UAE was the most important destination last year. Indians such as Venkat constituted 42.3 per cent of the UAE's labour force in 2008. Image: A waitress serves at Ziara Ramadan tent near the Emirates towers in Dubai. The Indian missions in Dubai and Abu Dhabi have said they are gearing services to meet a possible increase in the number of workers returning to India as a result of this development, although analysts see little if any real impact on the employment situation. Dubai's government sector, including government-owned companies like Dubai World, is by far the largest employer of expatriate labour. Within this sector, property giants such as Emaar, Dubai Properties and Tatweer have scaled back operations to a large extent, creating a knock-on effect on the other large employer -- the private-sector construction companies. On the other hand, infrastructure creators like the Roads and Transport Authority have continued to invest, completing massive projects such as the Dubai Metro in the teeth of the credit crunch. 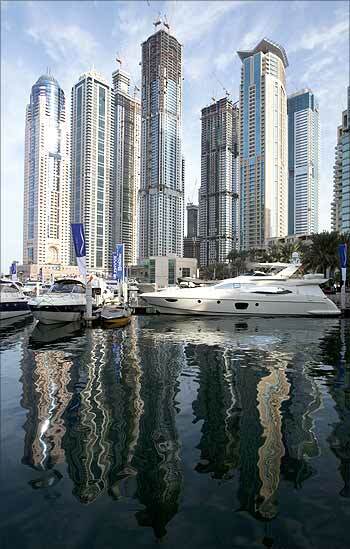 Image: Residential tower blocks are reflected in the waters of Dubai Marina. Any decline in the number of Indians working in the UAE would also result in a drop in remittances to India, which totalled more than $43.5 billion in the financial year 2007-2008. As many as 340,000 Indians migrated to the UAE last year to take up employment, but the number has been dropping as the opportunities decrease in the UAE while increasing in India, which is expected to post an almost seven per cent increase in GDP this year compared to a minor gain or a minor drop in the UAE's economy. One of the most enduring images in recent memory is that of an Indian worker in a yellow hard hat toiling to build Burj Dubai, the tallest manmade structure in the world. 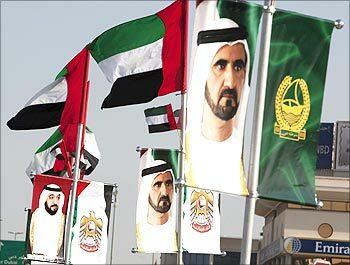 Image: UAE President Sheikh Khalifa (left) and Sheikh Mohammed bin Rashid Al Maktoum (center) in Dubai. Indian workers have been considered the backbone of the UAE economy for the past three decades. They work in temperatures that are almost inhuman, are sometimes fed poorly and often paid low wages compared to other categories of workers. There have been instances of salaries remaining unpaid for months on end, resulting in the setting up of privately run charities that help those who become destitute due to massive loan burdens back home. Many workers die in worksite accidents while some have been known to have committed suicide. Stocks may crash with just a nudge from the global economy, but these workers will continue to get into the company bus every morning and toil at whatever jobs they can get as long as there are jobs to get. 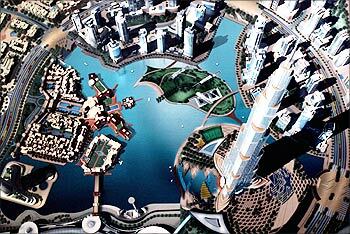 Image: An artist's impression of one of the world's tallest hotels, which Emirates said it would build. In March this year, more than 20,000 Indian workers had to leave Dubai after their employers laid them off, according to figures released by the Indian consulate. A large majority were from the construction sector. Some were re-deployed on projects in other Arabian Gulf countries, such as Qatar, while most went back home. This came after Dubai-based market research company Proleads estimated that more than half of the UAE's planned $1.28 trillion construction projects were on hold, as the real estate sector struggled with the global economic downturn. That number has since risen to over 65 per cent of projects on hold or cancelled. 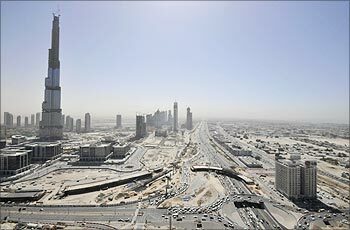 Image: The world's tallest tower Burj Dubai stands on Sheikh Zayed Road in Dubai. The silver lining here is that while Dubai struggles to fulfil the goals that it set in boom times, other parts of the Arabian Gulf region are quietly forging ahead, creating employment opportunities. These include the UAE capital city of Abu Dhabi, which has deployed more than $650 billion of oil revenues through its sovereign wealth funds and wants to become the tourism destination of the world. Abu Dhabi has sketched out plans to have branches of the Guggenheim Museum and the Louvre, and successfully hosted its first Formula One race this year. Saudi Arabia, the region's largest crude exporter, is also weaning its economy off its dependence on oil. And Qatar, which has the world's largest gas reserves, is positioning itself as a financial and real estate hub. 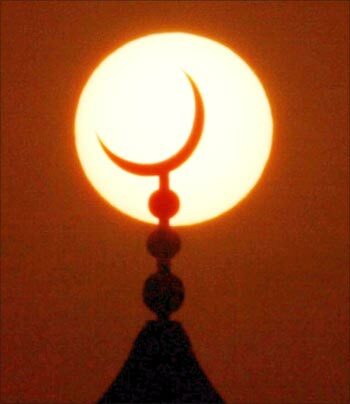 Image: The sun sets behind a mosque during Ramadan in Dubai.